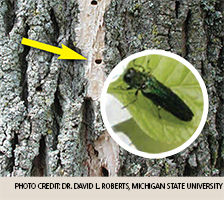 The Emerald Ash Borer (EAB) is an invasive pest, introduced from Asia, that attacks all varieties of Ash trees. Its larvae live and eat under the bark while the adult beetles emerge in June, feeding in the canopy before reproducing and laying eggs in the twigs and branches. Trees may begin to die within only two years of the first signs of EAB's presence. Levanduski Landscapes Inc. can treat and help protect your trees from EAB. Preventative treatments work best when the tree is in good health and shows no signs or symptoms of Emerald Ash Borer attack. Early, preventative action is the best way to protect from the Emerald Ash Borer. As with any insect management effort, optimal timing is required to achieve the best results. 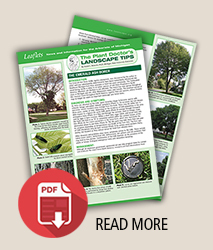 After a free consultation with our customers and examination of their trees, Levanduski Landscapes Inc. will determine the best course of action to target both adult beetles and young larvae. Treatment methods vary and we will help our customers choose the most appropriate and cost effective strategy for eliminating the EAB. Contact Us Today For a Free Emerald Ash Borer Evaluation! © 2019 Levanduski Landscapes, Inc.